Using historical fiction as a source for movies instead of actual history is nothing new. 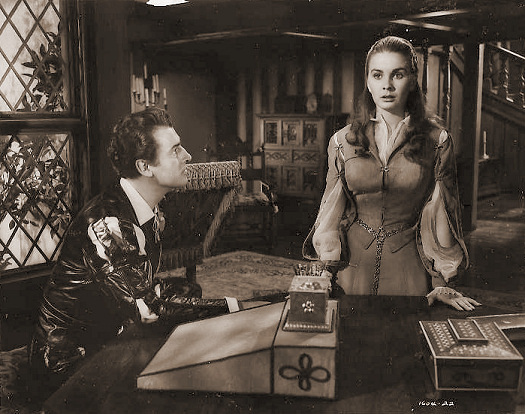 Don’t blame The Other Boleyn Girl — Young Bess (1953) and similar movies did it long before. This tale of Queen Elizabeth I of England’s youth was actually based on a popular historical romance novel published by Margaret Irwin in 1944. Irwin wrote a series about QEI, as well as novels about Mary Queen of Scots and then various figures during the English Civil War. Young Bess begins with a series of vignettes of Elizabeth as a little girl basically getting rejected by her father and a series of “step-mothers,” to emphasize her tumultuous childhood. Then she’s a young woman played by Jean Simmons (who was coincidentally married to Stewart Granger, playing Thomas Seymour). Old fat Henry VIII (Charles Laughton, reprising the same act he played in 1933’s Private Life of Henry VIII) has finally gotten around to Catherine Parr (played by Deborah Kerr), who takes Elizabeth under her proverbial wing. That much is all reasonably agreed upon by historical accounts. It’s the relationship of Lord Admiral Thomas Seymour, who Catherine Parr marries after Henry’s death, that gets complicated in both history and the movies. In both, Elizabeth lives with the newlyweds, Catherine and Thomas. 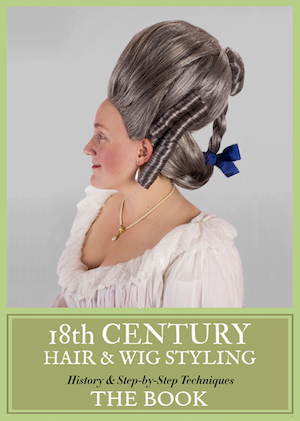 And things get … uncomfortably close … between young Elizabeth and Thomas Seymour. Contemporary accounts speculated everything from a secret marriage between the two and a pregnancy to merely a lecherous older man making passes at an innocent girl (she was 13-15 at the time). The movie Young Bess shrinks the age difference between Elizabeth and Thomas to about 15 years so it’s a bit less inappropriate and turns the plot into unrequited love on Elizabeth’s side. Biographer Allison Weir in The Life of Elizabeth I (1998) casually assumes that the young Elizabeth had romantic feelings for Thomas Seymour, saying “there is little doubt that she [Elizabeth] had been strongly attracted to him,” and frequently referring to this time in their shared household as her first sexual awakening. Further, Elizabeth’s own cross-examination on the issue hinted at a charged atmosphere, “Kat Ashley [Elizabeth’s governess] told me after that my Lord Admiral was married to the Queen, that if my Lord might have his own Will, he would have had me, afore the Queen” (Elizabeth and Mary: Cousins, Rivals, Queens, by Jane Dunn, 2003). The activities between Elizabeth and Thomas Seymour eventually got to the point that Catherine Parr (then pregnant) was jealous of the pair — her treasurer reported “the Queen, suspecting the often Access of the Admiral to the Lady Elizabeth’s Grace, came suddenly upon them, where they were all alone, wherefore the Queen fell out, both with the Lord Admiral, and with her Grace also.” Thus, Elizabeth was sent away from their house, and soon after Catherine Parr died in childbirth. Seymour was later arrested for treason due to his power struggles with his brother. Elizabeth’s relationship with Seymour was scrutinized during his trial; she came off relatively clean, and he was, of course, executed. We’re telling an intimate story against a background of sixteenth century court life, as opposed to a historical pageant about royal intrigues. We feel the love story between the Princess and Seymour — actually he was 25 years older than Elizabeth — will be more valid to audiences than a lot of historical detail which has no relation to our customers lives. Yep, historical nuance and all those details aren’t as important as the love story! Nothing new, folks. The renowned designer William Plunkett created the costumes for Young Bess, and they’re definitely 16th century through a 1950s lens. But they’re not terrible — the materials and trimmings are lush, and the silhouettes are essentially correct for the period. Yeah, there’s a lot of princess seams and WTF headgear, par for the course. Still, I have a certain fondness for 1950s historical costume movies. Hollywood really threw a ton of money at period pieces back then, and it showed. Everything is bedazzled within an inch of its life, no skimping! 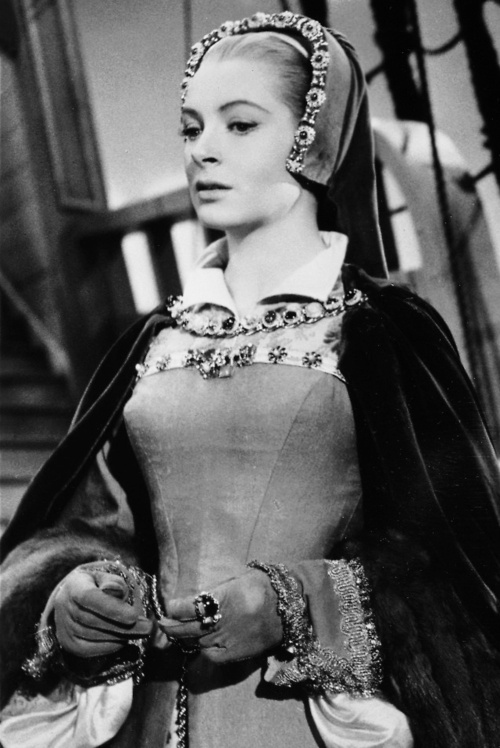 Deborah Kerr as Catherine Parr. Pink gown worn by Catherine Parr in the scene above. Jean Simmons as young Elizabeth in white, Stewart Granger as Thomas Seymour in red. Elizabeth’s white gown from the scene above. Seymour’s red suit from the scene above. Catherine Parr, center, in blue. 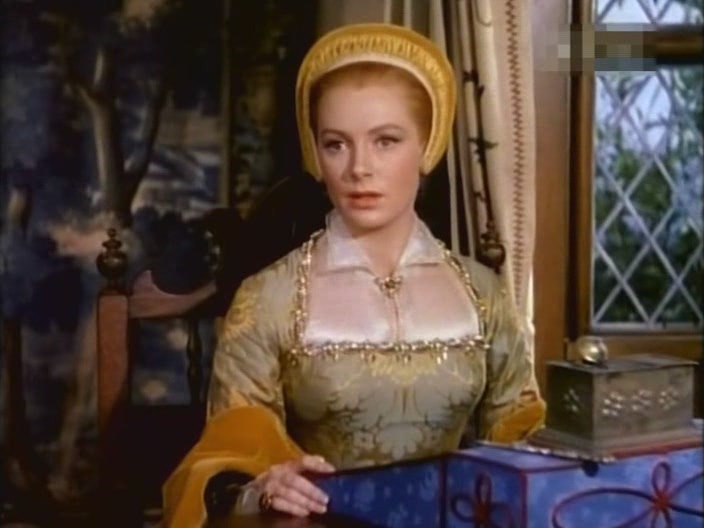 Blue gown worn by Deborah Kerr as Catherine Parr, in above & other scenes. 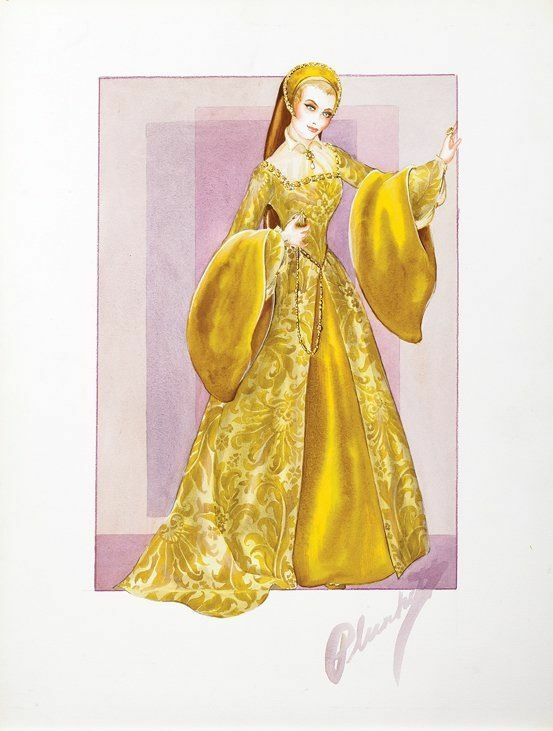 Walter Plunkett”s design for Catherine Parr’s yellow gown, shown above. 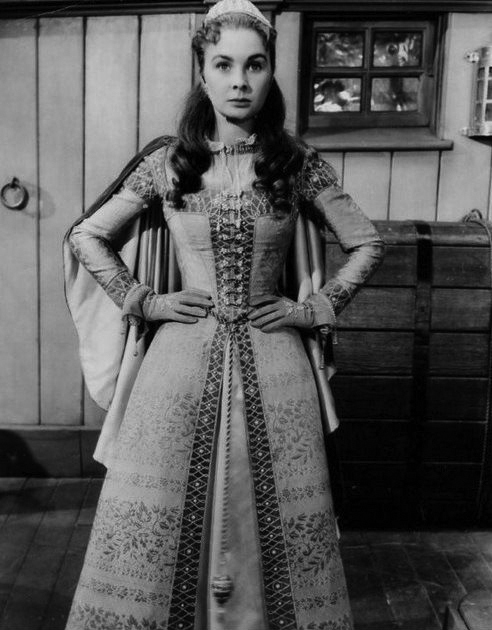 Jean Simmons as young Elizabeth. Green gown worn by Jean Simmons as Elizabeth in above & other scenes. 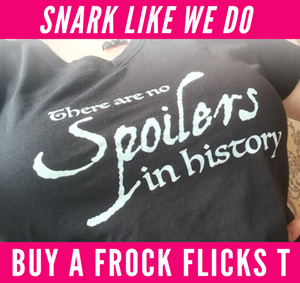 Are you a fan of historical fiction in the movies? I definately have to see this movie! The sad thing is that the French hoods in this movie aren’t any worse than the ones in Wolf Hall…. I remember watching this year’s ago when I was about 12-13. The same age Elizabeth was during the period. Thomas Seymour bothered me then. And his smarmy creepy paedophiliac behaviour bothers me more today. I won’t be watching this again. Historically and canonically young girls could and we’re married as young as 12. Margaret Beaufort was and gave birth to Henry VII and was unable to have other children. By 1545-46, they, the nobility waited until Bride was usually around 16-17 to ensure viable living children and mother. Most of Henry VIII’s wives were in their mid-20s, including the ones who bore him children. It was getting more common for Tudor / Elizabethan nobility to marry at that age. I have a bit of a girl crush on Deborah Kerr. She had such a lovely screen presence. I love this movie and definitely agree about the costumes, without those damn princess seams they would be pretty amazing. Ugh. Powerful older man makes passes at young girl… well, of COURSE she loved it! People do that with Evelyn Nesbit too, and it makes me livid! Thanks for bringing this one up! I know I saw it more than once as a teen when I binge-watched historical/swashbuckling movies on TNT (and I loved Stewart Granger!). Funny enough though I can’t remember much about the movie… will have to re-watch if I can catch it somewhere! If you love Stewart Granger, you MUST see him in Scaramouche. The costumes! The swordfights! The amazingly inaccurate women’s clothing!! For pure performance, I’d take the remake of The Prisoner of Zenda. Seen them both – and I do have Scaramouche on DVD ;-). I know these costumes got recycled and made over a LOT, and it’s always fascinating (and often a little sad) to see the actual costumes in their present condition after all that reuse and reworking. But I just don’t think the “green gown” in the last color shot is the same costume as the costume on Simmons in the BW (test?) shot above it. Similar cut on the body of the dress and similar front fastenings, but the fabric is totally different, even if you account for the trim, sleeves and petticoat being swapped out or removed/replaced. 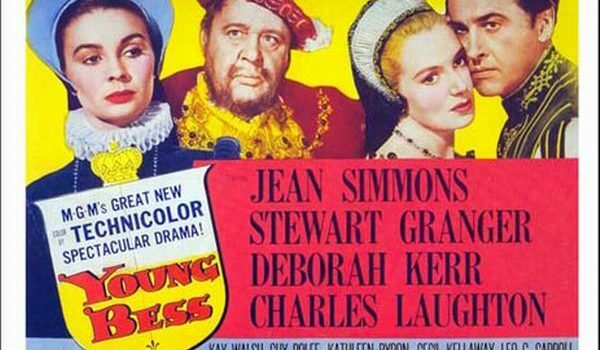 I haven’t seen “Young Bess” in years, but I love Jean Simmons and Deborah Kerr. Thanks for taking a look at it! Did you watch this movie recently? I know that it aired on TCM sometime in the past week. Yeah, it’s been in rotation on TMC for the past few months! Just watched it on TCM and blithely explained all the things wrong to my husband. Mind, he caught a few too. Margaret Irwin’s series is one of my favorite pieces of Elizabethan historical fiction (Legacy is the other), but the movie falls short a bit. Some of the costuming–what, no veils for Bess (particularly in that white dress)? And Jean Simmons’ 1st outfit struck me as completely wrong: too short, for one. I know at a much younger age, Elizabeth (3yo) was outgrowing her clothes and I suppose that was the impression they were trying to give. I did think Catherine Parr’s outfits were good, though, although I can’t be sure about the materials in terms of patterning or colors. Maybe a bit light, based on portraits of the time? But Kat Ashley wearing a gable hood wasn’t quite right, either. I wasn’t as squicked about the relationship between Elizabeth and Tom, given the historical reality. There’s a line in the book where Elizabeth accuses him of being 3x her age (13 and 39? ), and he points out that in X number of years, he’ll only be twice her age. The actors were a married couple at that point, too. Interesting fact: if you look at the movies they did together, there are a lot of young girl (legal or barely so) and older man fall in love stories; this actually echoes their relationship. They met when Jean was underage, fell in love, and Stewart divorced his wife so he could marry Jean when she was of age. And we aren’t talking about her next birthday, either. There were other things wrong, but can be attributed to the necessary compression of the timeline in the movie. But would it have killed them to age Edward properly?! Look up in the sky, is it a bird? is it a plane? No, It’s Tom Seymour!! Seriously what’s with the trunks??? ?